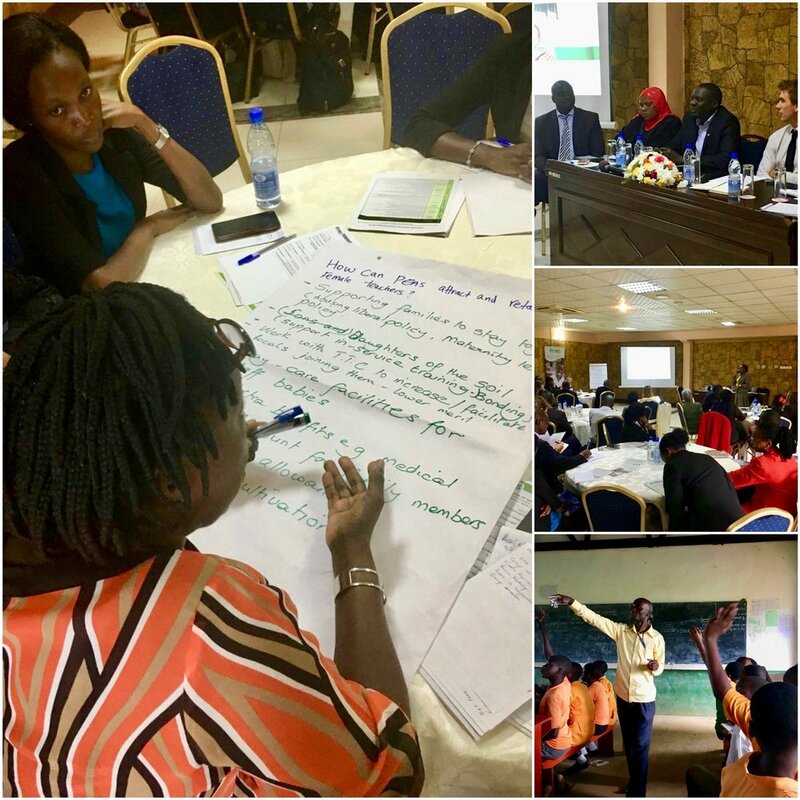 On Wednesday 18th April, PEAS held the PEAS-Ark Learning Summit in Kampala, Uganda, to engage sector stakeholders on aspects of the PEAS model including school management practices and the use of data to drive school improvement. The event also served to share results from a three-year evaluation examining the impact of the PEAS network under the Universal Secondary Education (USE) programme. The evaluation was completed by researchers at the Economic Policy Research Centre (EPRC) at Makerere University and compares 11 PEAS schools to 17 randomly selected non-PEAS schools (government schools and other private schools). It found that PEAS schools are more equitable, of higher quality and more cost effective than other school types in Uganda, and suggests that public-private partnerships (PPPs), such as the USE programme, can work. However, for PPPs to work, the selection of the non-government partner is crucial. When asked what sets PEAS apart from other operators, Joanna Harma, an independent researcher and expert on low-cost private schools, commented, “I think the key difference [with PEAS] is the sense of mission, and the absence of the profit motive. PEAS is providing as equitable access as possible to the highest possible quality of education – balancing the imperative to control costs while still providing schools and teachers with the support they need. Good quality isn’t easy, and it seems to be PEAS’ commitment to developing good school leaders and effective training that sets it apart. I don’t think PEAS could be doing this if they had to chase a profit at the same time.”. The research team at EPRC and Dr. Rachel Linn, Head of Monitoring and Evaluation at PEAS, shared the results of the evaluation. According to the evaluation, 58% of PEAS students are from the lowest two wealth quintiles. Despite having worse prior attainment, PEAS students scored 1.2 points higher in NAPE English assessments than students in government schools and 1.6 points higher than students in private schools. In NAPE Maths, PEAS students also scored higher. PEAS students are therefore learning more than students in other schools. The evaluation suggests that PEAS school support and supervision are driving PEAS’ superior performance. According to Mildred Barungi (ERPC), “PEAS schools are increasing access to secondary for children who would otherwise be excluded from government and private schools. Despite having worse prior attainment, PEAS students perform as well as students at non-PEAS schools. This is an important finding, as it demonstrates that PEAS is better at helping the most disadvantaged students close the achievement gap.”. Following the research presentation, there was a panel discussion moderated by Ed Barnett (Department for International Development), with PEAS school leaders and PEAS Country office staff, to explore strengths of the PEAS model including target setting, teacher support and development, and school financial management. Ismael Mulindwa, the Commissioner of Private Schools and Institutions, Ministry of Education and Sports (MoES), then shared the government’s goals for universal secondary education in Uganda and its work with PEAS as progress towards that goal. In the afternoon, attendees engaged in dialogue on challenges that PEAS schools and staff face including the recruitment and retention of female teachers and the prohibitive cost of participation in secondary school. While PEAS schools are more affordable than other schools, PEAS data and experience indicates that the cost of attending secondary is still a barrier for the poorest students. The event closed with Libby Hills, PEAS Chief Technical Officer, and Senkasi, who presented PEAS’ new strategy. PEAS’ new direction focuses on using PEAS’ experience as a credible and high performing school operator in Uganda to scale PEAS’ impact beyond its own school networks. PEAS intends to do this by collaborating and sharing PEAS best practice with other school operators and the MoES. Prior to Wednesday’s workshop, PEAS hosted school visits to PEAS Nangonde (Namutumba District) and PEAS Malongo (Mayuge District). Through these visits participants were able to see PEAS school support and supervision in practice and engage directly with school leaders, teachers, students and community representatives. To find out more information about PEAS, please contact us at info@peas.org.uk.